13 is a great card game that was invented in Vietnam and Southern China. It is also known as Tien len, Vietnamese cards, and American Killer. It is considered a “climbing” card game and is meant for 4 players. The object of 13 is to be the first player to get rid of all your cards. From lowest to highest, the ranking is: 3, 4, 5, 6, 7, 8, 9, 10, J, Q, K, A, 2. The 2 is the most powerful card in the game. Suits also have rank in this game. 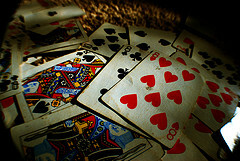 From lowest to highest, the ranking is spades ♠, clubs ♣, diamonds ♦, and then hearts ♥ is the highest suit. So the 3 of spades is the lowest single card in the game, while the 2 of hearts is the highest ranked. Bomb: A bomb can be played on any of your turns. It will end that round and allow you to begin the next round (unless someone plays a higher-valued bomb on top of yours). A four of a kind is the highest-valued bomb (ex: 5♣,5♠,5♥,5♦). Another type of bomb is pair sequence of the same color (ex: Q♣, Q♠, K♣, K♠, A♣, A♠). The more cards involved in the pair sequence, the higher in value it is (ex: 3♥, 3♦, 4♥, 4♦, 5♥, 5♦, 6♥, 6♦, is worth more than a 10♠, 10♣, J♠, J♣, Q♠, Q♣). From there, the turns go in a clockwise fashion. If it is your turn, you can decide if you want to play or pass. If you pass, you can’t play again until all other players have passed and that round is over (you must pass if you can’t lay down a hand with a higher value). In order to play, you must be able to lay down a hand that has a higher value than the hand just laid down by the previous player, but it has to be the same type of hand (unless you are dropping a bomb). In other words, if the round begins with a pair, you can only play pairs until that round is over (with exception to bombs). The round is over once all the players pass. The player that ended the round gets to begin the new round by playing anything he/she wants. The player who gets rid of all their cards first, wins. The others can continue to play for 2nd, 3rd, and so on.